This document describes how to setup Aviatrix access account by using IAM user access key and secret id, instead of IAM roles. This approach is applicable to AWS China as Aviatrix does not support IAM role yet. 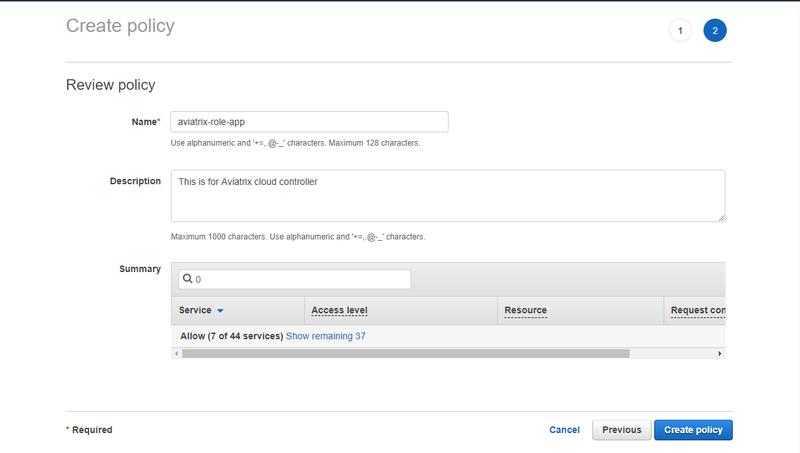 Login to AWS console, click IAM, click Policies, click Create Policy, click JSON. Delete the example JSON text. Copy and paste the Aviatrix AWS policy to create a new IAM policy, as shown below. Give policy a name, aviatrix-role-app. Login to AWS Console, click IAM, click Users, click Add user to create a new IAM user and allow programmable access, as shown below. Next you need to attach the created policy to this IAM user, as shown below. Finally create a access key and secret key to be used by Aviatrix access account for this IAM user.